As precipitation flows over the land as runoff, it dissolves or otherwise carries a variety of materials to streams and lakes downgradient. Some of these materials include minerals, such as iron, sulfur, and phosphorus; gases, such as oxygen, carbon dioxide, and nitrogen; microorganisms; organic materials from plants and animals; and pollutants , such as pesticides, metals, and eroded soils. Many of these materials are important to biological processes within the lake, whereas others may be harmful contaminants . The biology and chemistry of fresh waters are closely linked. Each strongly influences the other, and multiple feedback loops exist between them. Probably the most important of these interactions is the photosynthesis–respiration process. In photosynthesis, aquatic plants and algae use the energy from sunlight, carbon dioxide, nutrients, and water to produce organic compounds (sugar), water, and oxygen as end products. The Sun's energy is stored in the sugar as chemical energy. The photosynthetic uptake of carbon to form sugar is called primary production. The oxygen produced during photosynthesis is the primary source of dissolved oxygen in the water and of oxygen in the atmosphere. Before plants or animals can utilize the chemical energy produced by photosynthesis, it must be transformed in a process called respiration. Respiration consumes oxygen and releases carbon dioxide back into the water. In productive and thermally stratified (layered) lakes, photosynthesis dominates in the epilimnion . The excess organic matter produced in the well-lit euphotic zone eventually sinks down through the water to the sediments, where respiration processes dominate. Thus, a significant difference often exists between the oxygen-rich euphotic zone and the underlying, oxygen-poor aphotic zone. The presence or absence of oxygen has significant effects on the important oxidation–reduction chemistry. Chemical reactions in which electrons are transferred from one atom to another are known as oxidation–reduction reactions. The presence of oxygen promotes oxidation reactions (gain in oxidation state, such as Fe ++ to Fe +++ ) because few free electrons are available. In the absence of oxygen (anoxia), abundant free electrons promote chemically reducing conditions (loss of oxidation state). Such reactions affect substantially the state of many chemicals found in the water. For example, oxidized sulfur (as sulfate, SO 4 − ) is reduced to sulfide (as in hydrogen sulfide, H 2 S) under reducing conditions near the lake sediments. The resulting hydrogen sulfide gas, when released from the water, is characterized by the familiar "rotten egg" smell. Carbon dioxide is an important gas in lakes. Although highly soluble in water, most carbon dioxide in lakes is formed as an end product of respiration. As carbon dioxide dissolves in water, it forms a series of compounds, including carbonic acid, bicarbonate, and carbonate. The resulting carbonate chemistry, along with common anions such as hydroxide (OH − ) and sulfate (SO 4 − ), contribute to the alkalinity (buffering capacity) of water. Alkalinity is a measure of the ability of water to resist changes in pH, which is a measure of the amount of acidity. A neutral pH is 7; acidic conditions have pH less than 7; and alkaline solutions have pH greater than 7. Many aquatic organisms have fairly strict pH requirements, so the amount and stability of pH is very important. For example, the poorly buffered lakes in upstate New York were unable to resist changes in pH caused by acidic precipitation, and the resulting low pH values (<5.5) reduced the diversity of organisms to only those few adapted to low pH. Alkalinity is a conservative parameter: that is, it does not change readily in well-buffered lakes. On the other hand, pH values may vary both temporally and spatially within a lake. For example, during intense photosynthesis in the euphotic zone, carbon dioxide and its dissociation product , carbonic acid, can become less abundant. With less of this acid, pH values may rise to as high as 9. Additionally, respiration in the hypolimnion of a productive lake produces an excess of carbon dioxide, which dissociates to carbonic acid and lowers the pH. The sum of the concentrations of individual ions and compounds dissolved in water (i.e., total dissolved solids) determines total salinity. Conductivity, which reflects the ionic strength of water (i.e., the concentration times the charges of individual dissolved species), is not equivalent to salinity. Watershed geology largely determines the type and amount of ions present in lakes and rivers. The most common ions present in many inland lakes and rivers include: calcium (Ca), magnesium (Mg), sodium (Na), potassium (K), bicarbonate (HCO 3 ), sulfate (SO 4 ), and chloride (Cl). The salinity of inland lakes varies widely. Soft waters refers to waters of low salinity, specifically low calcium and magnesium, which usually are derived from drainage from old, weathered, highly insoluble igneous and metamorphic rocks. Hard waters have high salinities and high calcium and magnesium that often result from surface drainage or groundwater input from land containing sedimentary rocks such as limestones and/or evaporites . Precipitation and dry fallout are additional sources of salinity to surface waters, especially near the coast where sea spray carries large amounts of some ions (sodium, chloride, magnesium, and sulfate) into the atmosphere. Windblown dust also contributes salts to rain, snow, and dry fallout. Lakes lie along a salinity gradient. Salinity in Waldo Lake in Oregon has been recorded at only 0.002 grams per liter. This biologically unproductive lake simply does not contain enough ions for most biological organisms to exist. On the other hand, saline lakes, which occur in semiarid or arid regions where evaporation exceeds precipitation, has a salinity of 332 grams per liter, nearly 10 times greater than that of sea water. 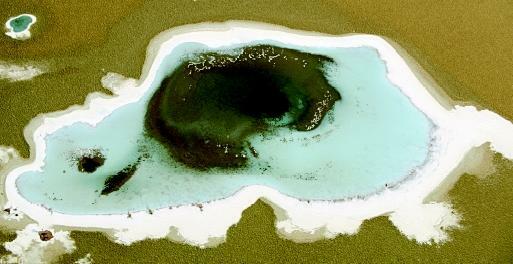 Salt deposits in this Egyptian lake derive from two sources. Mineralized groundwater issues from a spring directly into the lakebed (visible as the dark area in the lake). Evaporation progressively increases the salinity, and salt deposits become concentrated and precipitate at the water's edge (visible as the white outer areas). Algae and aquatic plants, the primary producers in aquatic ecosystems, require the major nutrients—carbon, nitrogen, and phosphorus—in the approximate proportion of 41C to 7N to 1P (by weight). If one of these nutrients is present in a lower proportion, it may limit the algae or plant growth. This understanding is the foundation of Liebig's Law of the Minimum, which states that the growth of a plant is limited by the material in least supply. Which of these three major nutrients is most likely to limit aquatic productivity? Because carbon dioxide is plentiful in the atmosphere and in water, carbon seldom is limiting to aquatic productivity. Nitrogen gas is also abundant in the atmosphere, and many blue-green algae are nitrogen fixers. This means that they can convert nitrogen gas into the organic nitrogen required in cellular use. Phosphorus, on the other hand, has no gaseous phase. Although it is found in phosphate rocks, fertilizers, human and animal waste, and organic material, and is required in a relatively small proportion by aquatic plants, phosphorus is most often the limiting nutrient in fresh-water systems. The limiting role of phosphorus does not necessarily mean that it is in scarce supply. Rather, it refers to the importance of phosphorus in regulating aquatic production. The addition of phosphorus to a phosphorus-limited system results in additional algae or plant growth. For this reason and because phosphorus has no gaseous phase, phosphorus is most often the target of lake management programs addressing excessive enrichment and plant growth. Although lake sediments serve as an ultimate sink for whatever is in the water, movement of materials is not solely to the sediments. Strong storms or turnover events may mix some sediment chemicals and particulates back into the water. Other chemicals may slowly diffuse (spread out) from the sediments to be eventually mixed into the surface waters by internal currents or during periods of turnover. The chemical environment in the sediments is a dynamic one. Biological and chemical processes continually bring change. For example, consider dead plant material settling onto the sediments. Bacterial decomposers use this organic matter as food and convert the organic phosphorus to phosphate (PO 4 3− ) and the organic nitrogen to ammonia (NH 4 + ). If oxygen is present, ammonia can be oxidized to nitrate (NO 3 − ), and oxidized iron can tie up the phosphate as ferric phosphate. However, if reducing conditions occur, the nitrate is reduced back to ammonia, and the ferric iron is reduced to ferrous iron, which cannot hold the phosphate. Phosphate is then released back into the water. This reaction is referred to as internal phosphorus loading and is a major source of phosphorus to eutrophic lakes. In deep lakes, extreme pressures in deep water allow gases to accumulate and concentrate. Normally, these gases would escape to the atmosphere during periods of turnover, when the lake temperature becomes nearly uniform from top to bottom, and it loses its thermal stratification (layering). However, in the tropics, where temperatures do not vary significantly during the year, many lakes remain permanently stratified. In Lake Nyos, a volcanic lake more than 230 meters (600 feet) deep in Cameroon, Africa, dissolved carbon dioxide gas seeps from springs beneath the lake and is trapped in the deep water by hydrostatic pressure. On August 12, 1986, some event, possibly an earthquake, allowed the dissolved gas to suddenly escape. What happened in Lake Nyos was similar to opening a shaken bottle of carbonated soda. As long as the cap is on, the carbon dioxide gas stays dissolved under pressure. But when the cap is removed, the bubbles (and the soda) explosively flow out of the bottle. 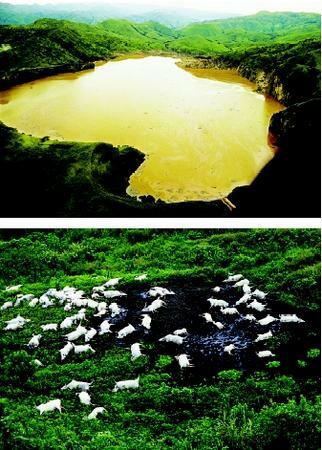 In 1986, a catastrophic release of carbon dioxide gas from Cameroon's Lake Nyos (top) asphyxiated thousands of people and animals, including livestock (bottom). The rare natural disaster stemmed from basic geological, physical, and chemical processes associated with some lakes. an estimated speed of 25 to 50 kilometers per hour (about 15 to 30 miles per hour). The gas displaced oxygen, and more than 1,700 people and 3,000 cattle were asphyxiated as far away as 23 kilometers (about 14 miles). Lake Monoun, also in Cameroon, has similarly erupted, killing 37 people in 1984. Lake Kivu in Rwanda has a similar buildup of gases, including methane. Locally some of the trapped gas may be collected and used as fuel. SEE ALSO Acid Rain ; Chemicals from Agriculture ; Ecology, Fresh-Water ; Fresh Water, Natural Composition of ; Fresh Water, Physics and Chemistry of ; Hot Springs and Geysers ; Lake Formation ; Lake Management Issues ; Lakes: Biological Processes ; Lakes: Physical Processes ; Mineral Resources from Fresh Water ; Nutrients in Lakes and Streams ; Springs . Kalff, Jacob. Limnology: Inland Water Ecosystems. Upper Saddle River, NJ: Prentice Hall, 2002. Wetzel, Robert G. Limnology: Lake and River Ecosystems, 3rd ed. San Diego, CA: Academic Press, 2001. * See the "Senses, Fresh Water and the" entry for a photograph of Kelimutu Volcano and one of its highly mineralized, acidified crater lakes.